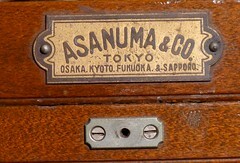 Asanuma Shōkai has been a Japanese distributor of photographic supplies from the 19th century to the present day (2010). 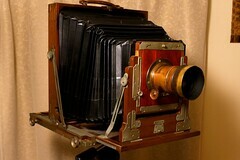 It manufactured its own large-format studio or field cameras, and also some amateur cameras in the 1910s and 1920s. Today it is best known for its range of accessories sold under the brand King (キング). The shop was founded by Asanuma Tōkichi (浅沼藤吉) in 1867 or 1871, depending on the sources. By 1901, the company was called Asanuma Shōten (浅沼商店), and the address was Nihonbashi-ku Honchō 2-chōme in Tokyo (東京日本橋区本町二丁目). Some years later, its name was changed to Asanuma Shōkai (浅沼商会, i.e. Asanuma trading company). It sold the Eagle plate folders around 1915 and the Focal Happy at some later date. It was certainly the owner of the Happy (ハッピー) brand, later used on the Happy plate folder made by Molta. In the mid-1920s, the catalogue of the company contained imported cameras only, except for a few field cameras. The brand name King (キング) was already in use in the mid-1930s for various accessories, such as an exposure table, an accessory rangefinder or tripods. From c.1933, Asanuma distributed the Happy and the various Minolta models of the Molta company, later Chiyoda Kōgaku Seikō. It apparently had the exclusive right to sell these cameras until the end of the second world war. After the war it still appears as an authorized dealer of the Minolta cameras, until at least as late as 1952, often together with Misuzu Shōkai. Asanuma also distributed the Congo lenses of Yamasaki, whose founder was a former employee of the company. The Congo lenses appear in wartime Asanuma catalogues, and the company was still an authorized dealer of Yamasaki in 1959–60. At the same era, it was also advertising Taron products; its main address was Chūō-ku Nihonbashi Takarachō 3–3 (中央区日本橋宝町3–3) in central Tokyo. Today (2008), the company sells many accessories under its own King brand. The headquarters is in the Nihonbashi Building. Advertisement by Asanuma in Ars Camera April 1922. June 1924 Asanuma catalogue: front cover, field cameras, and back cover. Advertisement by Asanuma in Asahi Camera February 1930. ↑ The June 1901 catalogue of Asanuma Shōten, available in electronic form at the National Diet Library, contains a portrait of Asanuma Tōkichi on this page and says "Established 1867" on this page. — Lewis, p.4, and the company's official history page say that the shop was founded in 1871 by "Asanuma Tokichi". ↑ 淺沼商店 in older orthography. ↑ 淺沼商店 in older orthography. Source: June 1901 catalogue of Asanuma Shōten, available in electronic form at the National Diet Library. This document contains a picture of the shop's building on this page, and various pictures of the show rooms and manufacturing departments on the following pages. ↑ 淺沼商會 in older orthography. ↑ Asanuma Shōkai. Shashin kikai zairyō mokuroku, June 1924. ↑ Oldest appearance observed so far: advertisement in Shashin Salon January 1934. ↑ Yamasaki history page; Inoue, p.130; Baird, p.59. ↑ Asanuma Shōkai. Shashinki to zairyō, October 1941. ↑ Advertisement for the Congo lenses published in Asahi Camera Annual '60. ↑ March 1959 advertisement reproduced in Kokusan kamera no rekishi, p.254. ↑ The exact address is Tōkyō-to Chūō-ku Nihonbashi 1–2–8 Nihonbashi Building 5th–6th floors (東京都中央区日本橋1丁目2番8号ニホンバシビル5階･6階), according to the official company profile. Ars Camera. Advertisement by Asanuma Shōkai in April 1922. No page number. Asahi Camera Annual '60 (アサヒカメラ年鑑'60). Tokyo: Asahi Shinbun-sha, February 25, 1960. Advertisement by Yamasaki Kōgaku Kenkyūjo. No page number. Asanuma Shōkai. Shashin kikai zairyō mokuroku (写真機械材料目録, Catalogue of photographic equipment and supplies). Catalogue dated June 1924. Document partly reproduced in this Flickr album by Rebollo_fr. Asanuma Shōkai. Shashinki to zairyō (写真機と材料, Cameras and supplies). Catalogue dated October 1941. Document partly reproduced in this Flickr set by Rebollo_fr. Asanuma Tōkichi (浅沼藤吉). Shashin kikai oyobi yakuhin shashinban oyobi sekiban kigu zukai mokuroku (写真機械及薬品写真版及石版器具図解目録, Illustrated catalogue of photographic materials, chemicals and lithography tools). Tōkyō: Asanuma Shōten (浅沼商店), June 1901. Available in electronic form at the National Diet Library. Leaflet for the Minolta and Happy range and King accessories, dating c.1936. Danzen kesshutsu shita kokusan kamera (断然傑出した国産カメラ, Definitely excellent Japan-made cameras). Document owned by A. Apra and reproduced in this Flickr album by Rebollo_fr. Shashin Salon. Advertisement by Asanuma Shōkai in January 1934. No page number. Baird, John R. The Japanese Camera. Yakima, WA: Historical Camera Publications, 1990. ISBN 1-879561-02-6. P.59. McKeown, James M. and Joan C. McKeown's Price Guide to Antique and Classic Cameras, 12th Edition, 2005-2006. USA, Centennial Photo Service, 2004. ISBN 0-931838-40-1 (hardcover). ISBN 0-931838-41-X (softcover). P.85.